The eNotes Blog: Check Out the New Teacher Resources in eNotes’ Study Guides! Check Out the New Teacher Resources in eNotes’ Study Guides! All of the helpful tools for your classes are now available in one place: find the Teacher Resources you need in eNotes’ study guides. Plus, grab a discount to the eNotes Teacher’s Edition with the 15% off coupon included in this post! Read on for more details. Recently, we received feedback from an eNotes customer to let us know that teachers needed an easier way to find the resources they were looking for on the site – items such as lesson plans, response journals, and quizzes in the given titles they teach. So, we listened! eNotes’ study guides now contain an area devoted just to teachers, meaning it’s easier than ever to find exactly what you’re looking for to help you teach smarter. 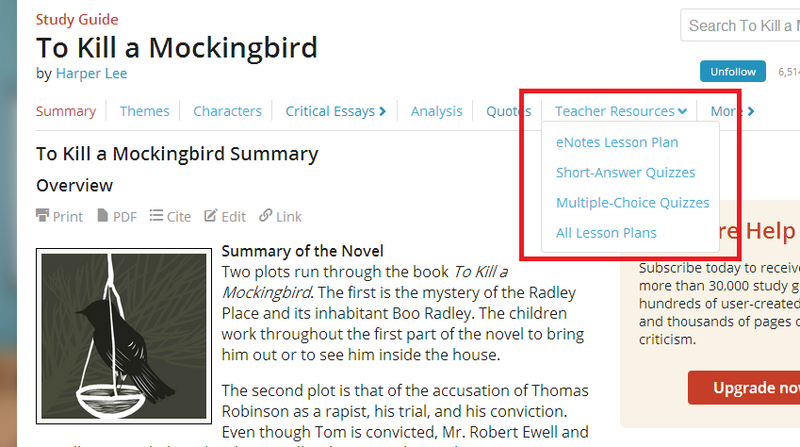 An English teacher covering To Kill a Mockingbird, for example, can now find lesson plans and a variety of quizzes listed in one place. This gives quick and easy access to two kinds of lesson plans: eNotes’ original documents, which include our own lesson plans and extensive response journals, and lesson plans available from other publishers in eNotes’ document store, many of which are free. eNotes’ lesson plans are expert, teacher-created resources that can be purchased individually or downloaded for free by subscribers to the eNotes Teacher’s Edition all-access pass. And now you can grab that special edition pass with a great discount! Use the coupon code LESSONS for 15% off your subscription. Offer valid until May31st. With your subscription you’ll receive unlimited downloads of eNotes’ lesson plans, more of which are added monthly, plus credits to ask questions in eNotes Homework Help, and complete access to hundreds of annotated eTexts and quizzes. Find out more about the eNotes Teacher’s Edition right here or sign up at this link. 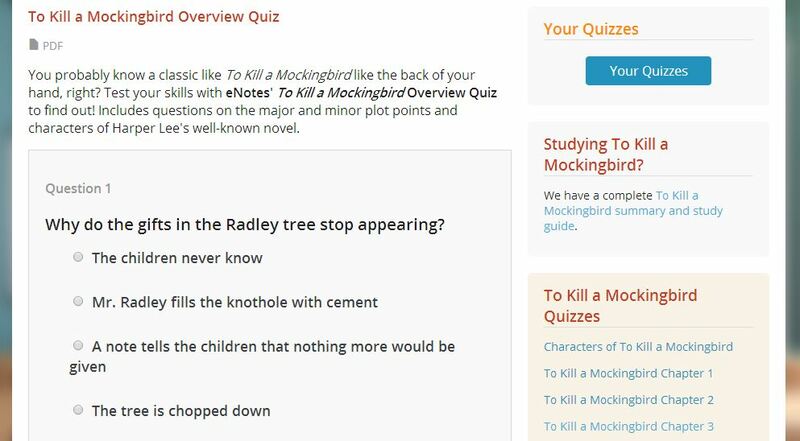 Choose our multiple-choice quizzes for a quick test of your students’ progress through their assigned reading. Each multiple-choice quiz contains 5-10 questions. The quizzes on a single topic can range from general overview tests to chapter- and character-based quizzes. Plus, all multiple-choice quizzes are available to all visitors to take online for free and available to download in PDF form (with an accompanying answer key) for Teacher’s Edition subscribers. Just look for the “PDF” icon beneath each quiz’s title to save it to your computer. Select our short-answer quizzes for a more thorough test of your students’ comprehension of a text. Each short answer quiz contains 10 questions per chapter or scene. These questions are designed to elicit answers one sentence to one short paragraph in length, thereby testing students’ understanding of plot and characters as well as recollection of important details. These quizzes are available to print or download exclusively to Teacher’s Edition subscribers. Check out the new Teacher Resources area of eNotes’ study guides to find expert help for your classroom and prepare for the ’14-’15 school year!